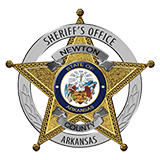 On Friday, January 29th at approximately 3:46 P.M. the Newton County Sheriff’s Office received a call of a man at in the parking lot of the Harp’s grocery store in Jasper that appeared intoxicated and was armed with a handgun. Jasper Police Chief Buckie Thomas responded to the call and was assisted by Newton County Deputies, Arkansas State Police and the 14th Judicial District’s Drug Task Force. When officers arrived they located James Floyd “Jamie” Henderson, aged 37, who appeared intoxicated. Officers found Henderson in possession of a semi-automatic .22 pistol, a fixed blade knife and a glass smoking device commonly used for the consumption of Methamphetamine. Henderson was placed under arrest and charged with Public Intoxication, Carrying a Weapon (handgun), Carrying a Weapon (knife) and Possession of Drug Paraphernalia. While at the scene, Deputies contacted the man that Henderson was with at the time of the incident, Charles Seagraves, aged 38. Deputies learned there was an active warrant for Seagraves and he was placed under arrest. When Seagraves exited the vehicle, Deputies observed a holstered revolver in the seat next to him. Deputies also discovered suspected Methamphetamine, suspected marijuana, several items of drug paraphernalia and prescription medication identified as Hydrocodone, but no prescription documentation was with it. In addition to the warrant, Seagraves was charged with Simultaneous Possession of Drugs and Firearms, Possession of Methamphetamine with the Intent to Deliver, Possession of Methamphetamine, less than 2 grams, Possession of Drug Paraphernalia, Possession of a Schedule I or II drug and Possession of a Schedule I or II Drug with Intent to Deliver. Seagraves is being held in the Newton County Jail. Mr. Henderson was one of the suspects involved in a shooting incident that occurred on Christmas night and was free on bond for that offense when this one occurred. Henderson went before a judge and the bond on his previous offense was revoked. Henderson is being held in the Newton County Jail.